The New Evangelization: What's it all about? The New Testament uses a whole series of expressions to describe Jesus’ activity of revelation. Apart from “proclaiming” or “teaching,” a word which recurs frequently to indicate his work is “evangelizing.” According to its normal meaning, already to be found in the Old Testament, this expresses the idea of announcing a message of joy, for example upon the birth of a child or after victory in battle. The meaning of the term, however, began to assume a significance that was more typically religious in the Book of Isaiah. There we find these words written: “How beautiful on the mountains are the feet of one who brings good news, who heralds peace, brings happiness, proclaims salvation and tells Zion: ‘Your God reigns’”’ (Is 52:7). The reference in this verse is to the herald who goes ahead of the people returning from slavery in Babylon. The inhabitants of Jerusalem, who are to be found on the walls and on the turrets of the city, are waiting for the remnant and from the top of the mountain they spot the messenger who, shouting at the top of his voice, proclaims its liberation and their return to their homeland. In the prophet’s mind, however, the herald is announcing the real victory. This is not so much the return from exile so much as the fact that God is returning to dwell in Zion, giving birth to a new stage in history. The same concept is taken up again by the prophet in another passage, where he says: “The spirit of the Lord has been given to me because the Lord has anointed me; he has sent me to bring good news to the poor” (Is 61:1). The similarity between these expressions and those we find in the New Testament is very close. In his preaching Jesus identifies himself with the messenger of expectant joy. In his person and in the signs he accomplishes, he allows us to see brought to fulfillment the promise of God to give life to a new era in history, that of his kingdom. After him, the apostles, Paul and the disciples are identified as messengers who bear a proclamation of salvation and of joy. In a famous passage of the letter to the Romans, Paul quotes, literally, the passage from Isaiah and applies it to all Christians who proclaim the Gospel: “But, they will not ask his help unless they believe in him and they will not believe in him unless they have heard of him and they will not hear of him unless they get a preacher and they will not have a preacher unless one is sent, but, as Scripture says: ‘The footsteps of those who bring good news is a welcome sound’” (Rom 10:14–15). It is interesting to note that in this quotation Paul does not mention the mountains. The underlying significance of this helps us to understand the task of the new evangelizers; they have a mission that is destined for the whole world. In the book of the Acts of the Apostles, in fact, the Gospel is directly identified with the person of Jesus, the messiah long awaited and now come into our midst: “They preached every day in the temple and in private houses and their proclamation of the Good News of Jesus Christ was never interrupted” (Acts 5:42). As we can see from these initial reflections, evangelizing is simply to be equated with bearing the Gospel. However, there is an awareness, deeply rooted in the sacred texts, according to which the good news that Jesus announces is not a new doctrine, but rather is Jesus himself in his own person. As the content of his proclamation of joy, it is he who reveals the mystery of the Father’s love. In his own person the fulfillment of everything and the beginning of a new phase in the life of men and women and of history are given. The time has now come; in his person God says everything that is fundamental and essential for us to come to know him. What is asked for now is faith, as the response of love towards him. Once the Gospel is proclaimed, in fact, it needs to be heard; from this perspective the teaching of the apostle, Paul, is very incisive: “... as long as you persevere and stand firm on the solid base of the faith, never letting yourselves drift away from the hope promised by the Good News which you have heard” (Col 1:23). However, the Gospel does not bear witness only to historical facts, such as the preaching the death and the resurrection of the Lord Jesus, insofar as this is the event of salvation for all those who believe in him. Being the living Word of God, he is also an event that challenges people, penetrates into their lives, calling them to conversion and creating a community of faith, hope and love. Indeed, it is not just a simple word, but it is a creative force that brings about what it expresses. Saint Paul recalls this: the good news “came to you not only as words, but as power and as the Holy Spirit and as utter conviction” (1 Thess 1:5). All those who receive the Gospel become missionaries so that the joy that has been communicated to them and that has transformed their lives may allow others, too, to encounter the same source of love and of salvation. If the verb “to evangelize” and the term “Gospel” are to be found frequently in the sacred texts and, as a result, are commonly found in our language, “to evangelize” is, nevertheless, a term that arose only at a later stage. In all probability, it was Erasmus who first inserted into our language to designate what he considered to be a form of Lutheran fanaticism. As we know, Luther identified as the foundation stone of his teaching the Gospel alone, insofar as it was the proclamation of pardon and of salvation through faith in Jesus Christ. The Council of Trent, for its part, was constrained to intervene to maintain the broader understanding of the Catholic faith. Thus it was that misunderstanding gained the upper hand and, from the time of the Council of Trent, the Catholic world maintained a certain reluctance to use the verb “to evangelize” because it held it to be too Protestant. It preferred to speak of “mission.” Only in the eighteenth century did some Protestants begin to understand the need for missionary activity, neglected at the beginning of the Reformation, and it was actually on that occasion that they began to make reference to the term “evangelization,” a circumstance which, obviously, became a further pretext for Catholics not to use the term. Under the impact of the catechetical renewal of the 1950s, we began to speak of “evangelization,” to distinguish it from catechesis and from other forms of pastoral activity. Therefore, we speak about evangelization as the activity of the church that was identified with the first proclamation of the Gospel and of catechesis to define the systematic formation of believers who had already been evangelized. Since language at times follows the need for precision on the part of specialists, other expressions were introduced, for example “pre-evangelization” to indicate the preparation of non-Christians for the explicit proclamation of the Gospel. If, on the one hand, this recourse to linguistic subtleties is useful for specifying a particular reality, unfortunately, it is not always useful for providing a clear vision of the whole. One last glance at the evolution of the use of terminology reveals an interesting fact. In the documents of the First Vatican Council (1869–1879), the term “the Gospel” occurs only once, it is impossible to find the verb “to evangelize” and, obviously, the term “evangelization.” In the documents of the Second Vatican Council, on the other hand, “Gospel” is used 157 times, “to evangelize” 18 times and “evangelization” 31 times. As we know, the term came to assert itself more and more to the point of becoming part of our common language. The use of language, though, also points to an underlying culture and this leads us to identify the church’s activity of proclamation in the contemporary world as a priority. New situations, emerging from socio-cultural changes require a new evangelization: emigrants to other countries, large urban conglomerates in our own countries, masses from all levels of society in a precarious situation as to the faith, groups exposed to the influence of sects and of ideologies which do not respect their identity, causing confusion and provoking division. Some months later, during the visit to the Mogila sanctuary at Nova Huta, the same expression was used also for the first time by Pope John Paul II. It was June 9, 1979, and Karol Wojtyla was returning to his own country of Poland as pope. Nova Huta brings to mind the communist project of constructing an entire modern suburb, at the very gates of Cracow, where they were to make visible the power of that atheist ideology by means of the construction of the prototype of a communist city. The project placed at the heart of the area the great steel works, five times larger than the whole historic center of Cracow, with wide avenues, broad spaces of green and dwellings for at least 40,000 workers, the same number as those who were to be taken on by the factory. The communist authorities did not intend even remotely to give space for the building of a church. The then archbishop of Cracow, Karol Wojtyla, did not let himself become too upset. On Christmas night, 1973, in the freezing cold, he went to Nova Huta to celebrate Holy Mass in the open air. The influx of people was such that the authorities, civil and military, could not but go back on their decision not to permit the celebration. Returning to Nova Huta as pope, John Paul II could not forget what had happened in the preceding years and how he himself had acted then in his own person so that, before the power of atheism and secularism, life might be given to a witness of living faith. Wherever the cross is raised up, there arises the sign that the Good News of the salvation of man through Love has already reached that place. Wherever the cross is raised up, there is the sign that evangelization has begun. Long ago our fathers raised up the cross, in various parts of the land of Poland, as a sign that already the Gospel had arrived, that that evangelization had begun which was to be extended without interruption up to our days. With this thought in mind, the first cross was also raised in Mogila, close to Cracow, close to Stara Huta. The new cross of wood was raised up not far from here, during the celebration of the millennium. With that cross we received a sign, that is to say that on the threshold of the new millennium, in these new times, in these new conditions of life, the Gospel is proclaimed once more. A new evangelization has begun, as if it were a question of a second proclamation, even though in reality it is always the same. The cross stands aloft above the world as it turns on its axis. From that time onwards, for twenty-seven years, John Paul II used this expression many times and in different settings. It is not worth going through each of these circumstances. Still, we should seek to clarify two of John Paul’s texts, which appear to be in disagreement one with the other. Looking today at the atlas of Latin America, with more than seven hundred dioceses, with insufficient but dedicated personnel, with its management and its structures, with its guidelines, with the moral authority which the Church enjoys, we have to recognize in all of this the fruit of centuries of patient and persevering evangelization. Almost five centuries; in fact, in 1992, already very close, there will occur the fifth centenary of the discovery of America and of the beginning of its evangelization. As Latin Americans, you must celebrate this date in the light of serious reflections about the paths trodden in the history of this part of the continent, but also with joy and pride. As Christians and as Catholics it is right to celebrate this occasion by looking at these five hundred years of work in proclaiming the Gospel and in building up the Church in these lands. Look to God in thanksgiving to him for the Christian and Catholic vocation of Latin America and of gratitude to those who were living and active instruments of evangelization. Look in fidelity to your past of faith. Look at the challenges of the present and at the efforts being made. Look to the future, to see how to consolidate the work which has been begun. The commemoration of the half-millennium of evangelization will have its full significance if there is a commitment on your part as bishops, together with your presbyterate and with your lay faithful, a commitment not to re-evangelization, but to a new evangelization. It will be new in its ardor, new in its methods and new in its expressions. In this respect, allow me to entrust to you, synthesized in a few words, the aspects which appear to me to be the fundamental presuppositions for the new evangelization. The pope is calling for a renewed missionary enthusiasm, in such a way as not to remain stuck in the past. The use of the triad “ardor,” “methods” and “expressions” confirms the interpretation of a renewed way of situating matters in regard to the one and only evangelization undertaken by believers. The pope challenges the churches of Latin America so that they may be capable of renewing themselves, giving life to new and expressive forms of proclamation in a changed social context. The differences in activities within the one and only mission of the Church arise not from reasons intrinsic to the mission itself, but from the different circumstances in which that mission is unfolded. Looking at today’s world from the point of view of evangelization, three situations can be distinguished. First of all, there is that to which the missionary activity of the Church is directed: peoples, human groups, socio-cultural contexts in which Christ and his Gospel are not known or in which Christian communities sufficiently mature to be able to incarnate the faith in their own setting and to announce it to other groups are lacking. This is the mission ad gentes, properly speaking. Then there are Christian communities which have adequate and solid ecclesial structures, are fervent in faith and in life, who irradiate the witness of the Gospel in their surroundings and who feel a commitment to the mission of the universal Church. Finally, there exists an intermediate situation, often in countries of ancient Christian tradition, but at times also in younger Churches, where entire groups of the baptized have lost the living sense of the faith or even no longer recognize themselves as members of the Church, leading to an existence which is far from Christ and from his Gospel. In this case there is need for a "new evangelization" or a "re-evangelization." The stress in Haiti on new evangelization rather than re-evangelization raises questions about the interchangeability of the two terms in the subsequent encyclical. Therefore we ask ourselves: is the new evangelization a re-evangelization? The problem lies in the prefix “re” and in the multiple meanings it can have. It can express different meanings according to the use to which it is put: it can indicate the repetition of an action, as in the case of re-proposing something; but it can also express the return to a prior phase and an opposing sense, as in reacquiring. It can also have the sense of conferring new value to the verb from which it is taken, as for example in “to re-bind.” In our case, what does re-evangelization seek to designate? The repetition of the evangelization that has always taken place? Or a new evangelization in opposition to the preceding one? It would be different and pejorative if the verb were used in the third sense, that is, of conferring something new in value in terms of content. In this jungle of interpretation, I consider it best to avoid the neologism “re-evangelization,” to allow us to speak of the new evangelization as a form by which the Gospel is proclaimed with new enthusiasm, in a new language, which is comprehensible in a different cultural situation and with new methodologies that are capable of transmitting its deepest sense, that sense which remains immutable. 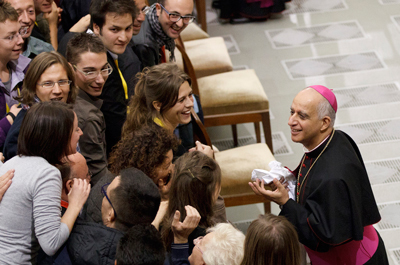 The Archbishop means well but he gets lost in words and misses, to my mind, the real challenge of evangelization. That has to do with the theological starting point. Since Vatican II none of the last three popes have taken seriously enough the orientation of "Gaudium et Spes" that sees the world or the "saeculum" as the primordial sacrament of God. Holiness already resides there because God pervades it. The church in the spirit of Jesus can foster God's work already in process in the world, but the church's evangelization doesn't start this work. A new evangelization needs to recognize the work of God in efforts of justice, peace, healing and compassion already going on in the "secular" world: e.g. UNESCO, Amnesty International, and with so many other individuals and groups. Then the church can collaborate in its own ways with these movements. Otherwise evangelization can come across as salesmanship, an attempt to add more paying adherents to the church's roles. FINALMENTE !! Our Church leaders have finally heard the cries of the truly faithful. We are truly blessed with presence of Pope Benedict XV1 & all our great clerical leaders. Unfortunately & quite naturally as time passes we , both laity & clergy, need to be re-energized in our Faith & beliefs. WE HAVE IT ALL, but many times we grouse & grumble about our fellow brothers & sisters in the Faith. It is time for all Catholics to come together under the banner of Christ in this Re-evangelization so that we can serve as an example to our children & grandchildren that our Catholic Faith must be the foundation in all our actions be they religious or secular; however, this will not occur unless we beg God for the graces to make this endeavor successful. With his new Re-evangelization we can pass through the eye of the needle but only with God's help. This article also appeared in print, under the headline "The New Evangelization," in the October 15, 2012 issue. Archbishop Rino Fisichella is first president of the Pontifical Council for the Promotion of the New Evangelization. This article is reproduced with permission from The New Evangelization (Gracewing Publishing).